Osborn, a 6-0 guard from Vancouver, WA, became the first player in the class of 2019 to sign with the Hustlin' Owls when he signed a letter of intent earlier this year. "Kam is big-time addition to our program," says Parnell. "We feel that he is one of the best PG's in the Northwest, regardless of level. His leadership skills are something you cannot teach and his ability to make people around him better is something special. We expect him to have an immediate impact." Osborn led Prairie HS to its fourth straight GSHL championship this past season, while averaging 18.0 points per game and 5.0 assists per game. He also became the all-time leading scorer at Prairie HS, passing former Gonzaga All-American Dan Dickau and MLB All-Star Richie Sexon. 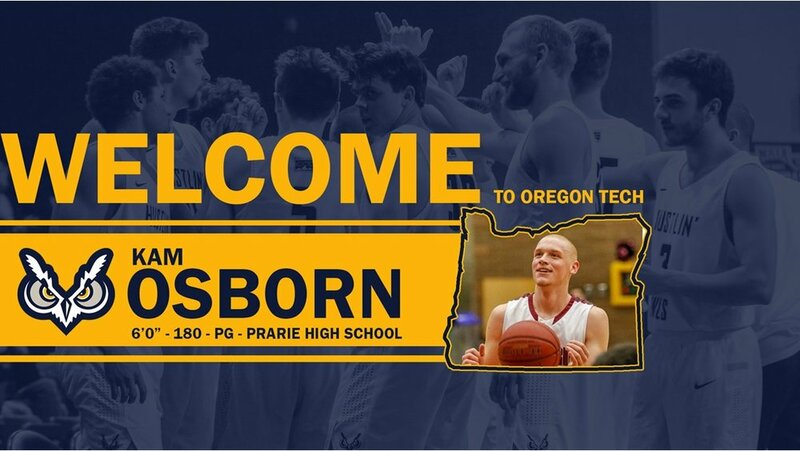 As a 3-year starter of Prairie HS, Osborn won 4 GSHL championships, finished Top 10 in the state twice, was named GSHL MVP twice and set the single season scoring record his junior season with 557 points. He played AAU basketball for Team Fly based out of Portland, OR. "I am very excited to further my education and basketball career at Oregon Tech and become a part of its great tradition and community," Osborn said. "I can't wait to play in front of that crowd!" Prairie High School head coach, Kyle Brooks, added, "We are very proud of Kam and excited for him to join the Hustlin' Owls. He is leaving a program with great tradition and joining one with an amazing tradition. The Hustlin' Owls are getting a good one and Kam will be dearly missed – a true point guard." Osborne will be joining an Oregon Tech team returning eleven players returning from a national finalist roster. Kam will be majoring in Communication Studies. He is the son of Bobby and Sara Osborn.